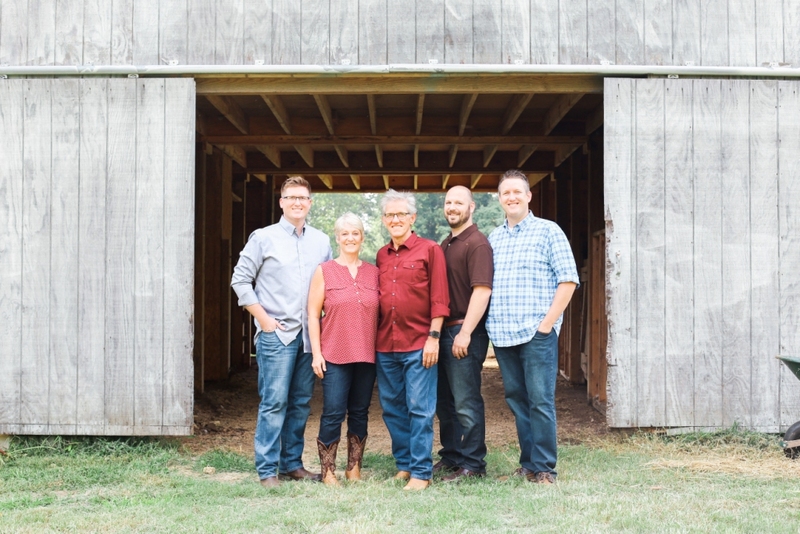 Dr. Dan (middle) with his sons and wife who are all chiropractors as well. For years I had suffered with chronic sinus problems and repeated sinus infections. I was told that they were just something I would have to get used to, that I would have to learn to live with. I was told that my only recourse was the persistent use of drugs including sudafed, actifed, and other claritin-like pharmaceuticals along with routine use of sore throat and cold relief over-the-counter medications. One day, a chiropractor shared with me that the human body is a self-healing organism. He stated that our birthright was to be healthy, not sick. He shared that the medical dictionary defined health as optimal physical, mental, and social well-being, not merely the absence of disease or infirmity. He suggested that my chronic sinus problems indicated that I lacked health in this area, that I was experiencing diminished health and well-being. He told me the nervous system is the master control system of the body and that it was possible to evaluate my nervous system to determine whether of not it was functioning optimally. He said that there is something called a subluxation, a spinal vertebra out of position, not working properly, and that this subluxation could cause nervous system malfunction. It could contribute to my health problem. I was attracted to the concept that the body is naturally self healing, that when it is properly functioning (i.e. healthy) there is no need for pharmaceutical medications. Dr. Dan Fonke speaking to a group of patients. I could remember visiting my grandmother in the nursing home and seeing her unable to walk, barely able to communicate, totally dependent on the staff for her every need, and taking anywhere between 12 and 15 different medications daily. I knew that I did not want to wind up in a similar circumstance in my later years. The chiropractor was straightforward and honest with me. He suggested that I have my spine evaluated for subluxation. He said that if he found subluxation he would be able to help me. If he did not find subluxation, he would tell me. Well, following my evaluation I was told that I had a subluxation in my upper neck spine, C-2 specifically. He utilized computerized surface eMG technology to help him locate my problem. He recommended a care plan designed to help my nervous system regain the level of optimal function available to me. Within a short period of time I started noticing that my sinuses were improving. Within three months I was not taking any sinus or sore throat medications, prescribed or over the counter. It has now been over fifteen years since I have needed one of these medications. Within a year of personally experiencing the benefits of this care and seeing the benefits which my wife and my three sons experienced I decided to become a chiropractor myself. It has proven to be one of the best decisions I have ever made. It is so gratifying to help someone understand the true meaning of health, to help them realize that they do not have to become chronically dependent on ever increasing dosages of pharmaceutical medications. 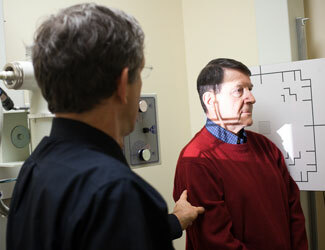 Dr. Dan Fonke performing an X-ray on a patient. I attended Life Chiropractic University in Atlanta, with my wife. We chose Life primarily because our chiropractor had gone there. We were glad we went there. The school gave us a very sound education in the anatomy and physiology of the body, in the study of the biochemistry, microbiology, pathology, osteology, radiography and more. We also learned about the concept of innate and universal intelligence. Universal intelligence is the intelligence in all matter that gives it organization. In fact, when something is organized, as matter is, the very state of organization indicates that there is an intelligence responsible for it. Innate intelligence related to the intelligence in living beings, the intelligence that takes you and me from just two cells at conception to 90,000,000,000 cells, all highly differentiated, at birth This same innate intelligence controls your ability to self-heal (from a cut, for instance) and self-regulate (regulate the body’s release of adrenaline, dilate the pupils, increase the heartrate, when you are placed in a situation where you have to move very quickly). I met my wife, Victoria, in 1981 in a graduate education course. We were both working on our Masters in Education. We were married in 1982 and are the parents of three wonderful sons. As the boys were growing up and playing various sports Victoria and I spent a lot of our personal time watching them compete. Part of the boys early growing up experience was spending time with us at the chiropractic college. As I am writing this all three of the boys are enrolled at the same chiropractic college that Victoria and I went to and they are receiving a wonderful education. In my spare time I love to read. When I was a teacher I would give the children short periods of time for USSR (Unrestricted Sustained Silent Reading). They loved it. I love spending personal time with my family. We go to the beach (OIB) regularly in the spring, summer, and fall. I enjoy spending time with my parents. Dad, 88, is retired from the USAF and, as a prisoner of war (WWII), regularly goes to Ft. Bragg to talk to the survival school troops about his wartime experience. Mom, 84, is involved at the church. Both started regular chiropractic care twenty years ago and the chiropractor used a gentle method of adjusting (see www.activator.com). As of this writing, each is on only one prescription medication (note the average 65 year old in America is on 3-5 prescription medications), each takes several supplements and vitamins, and they each enjoy an active lifestyle. 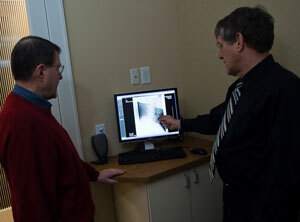 Dr. Dan Fonke explaining what was found in the X-ray. I receive a chiropractic adjustment every week. I work out regularly and I supplement daily. I do these things to enhance my own health. While I believe that there are times when a pharmaceutical medication is necessary, as in a diabetic needing an insulin shot, I also believe that the overuse of pharmaceutical medications in this country causes more problems than it solves. A leading medical journal has stated that properly prescribed pharmaceutical medications cause in excess of 100,000 deaths in the USA every year. Statistically, the US population consumes approximately 50% of the worlds medications. We are only 4% of the world’s population. Joseph Mercola, MD (see www.mercola.com) states that the vaccination for hepatitis, often given to one day old babies in this country, appears to be linked with the growing incidence of autism. He states that it is absolutely unnecessary and unwarranted to be giving young infants that vaccine and potentially exposing them (and their parents and loved ones) to a life of autism. Enough about me! How can we help you with today’s safe and natural chiropractic care? Contact our Greensboro chiropractic office so we can help you take your first step towards better health.